I will post some pics soon, but this was fairly easy. The hard part was determining which detector to get. I did a pretty thorough analysis and I picked the Beltronics 995 as the best "bang-4-the-buck". I got the detector AND the hard-wired kit. Amazon had the best prices. 2. Moved the electronics pack to get to the battery and popped open the batery cover. 3. Loosened the 2 rear tank bolts, and removed the front 2 tank bolts. 4. removed the cold air duct screws and "unhinged" from the tank. 5. Used 3 bungee cords around front of tank, hooking back of bungees to the rear seat "luggage" mounts. This puts the front of the tank into the air. 8. Using electricians pliers, put round lugs onto both red and black leads of the hard-wired kit. 9. Unscrewed the "-" battery connection and put the lug onto the battery post screw. 10. While I was in there, I also picked up a battery-tender from Walmart ($13.95) and hooked this up also. Cant find it on the Walmart site, but here is a pic of it on Amazon for $22. 12. Same steps as 9, 10, 11 for "+" connection. 13. Note, the battery-tender connector end fits (snaps) neatly under the seat and out the right side. There is a space between the subframe and the seat for it to hide there. Just pop it out when you need it. 13. Replace battery cover, electronics pack. Leave seat for later after securing tank. 14. Using 3-4 plastic tie straps, I ran the wires along the right side subframe and under the tank and under the right side cold air duct. 15. At this point, I could remove the bungees and then I bolted front of tank, rear of tank and replace the seat. remember, there is a lip on the front of the seat that goes under the rear mount for the tank. 16. Continued running the wires up and behind the instrument panel. 17. Removed windshield - there are 8 or so screws that hold this on. Need to drill 2 holes that will mount the detector. 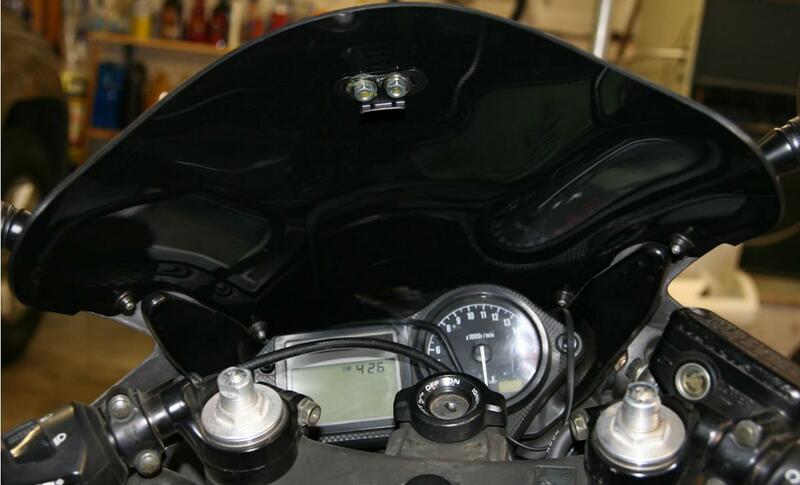 Easier to measure and align with the windshield off the bike. 19. Items needed from Home Depot (find these things in the hardware section in those specialty bin drawers. -- 2 stainless steel 1" 1/4x20 allen bolts with corresponding stainless nuts. -- 2 larger washers to prevent the screw head from slipping through the place where the suction cups were fitted (see below). 20. Detector - For the 995, there is a small metal stamped piece with 2 suction cups. I removed the suction cups and measured the centers twice (to make sure - measure twice cut once). 21. I first found the center of the windshield and made a little pencil mark on the top edge. 22. I then make a mark on the windshield 1-1/2" from the top center (in 3 places to make sure that the detector will be straight). Scribe a light line about 1" long between these points. 23. I then measured the distance between the centers of the holes where the suction cups were. 24. I then divided by 2, and made a scribe mark each side of center. 25. The intersection of these 2 points is where the holes will be drilled. 26. Use a sharp pointed scribe or punch to mark where the drill will go. 27. Use progressively larger drill bits until 2x1/4" holes are drilled. 28. Lay out screws, place metal washer on, then rubber washer. Slide each screw through hole. 29. Place rubber washer on screws (note: rubber washers are against both sides of the windshield), then place the radar detector bracket mount, then metal washer, then secure with the 2 nuts. Note: I mounted the bracket with the bracket holes on the top side. 30. I replaced the cold air duct screws and made sure that they were snapped under the tank. 31. Before replacing windshield, I rolled up and tied off excessive hard-wired kit wire and routed the rest so that it would not interfere with anything (easy to get to with the windshield off). 32. I replaced the windshield. 33. Snapped the detector on and it worked like a champ. Note that the wires are always hot as they are tied directly to the battery. 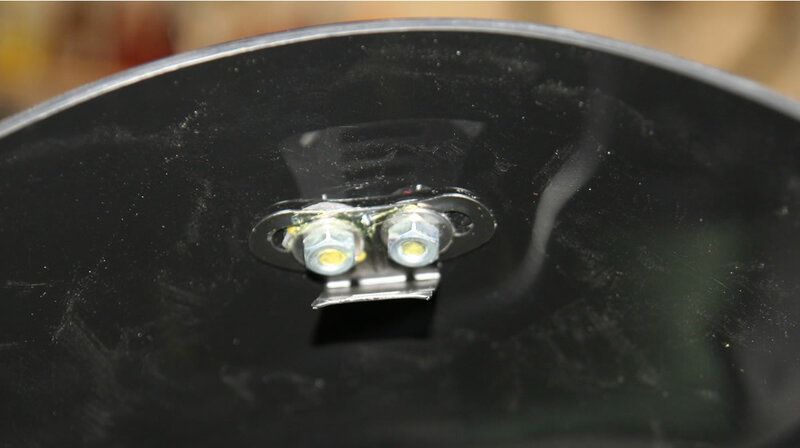 I actually called Beltronics and talked with one of their tech people who recommended hooking to battery instead of say headlights. Whole job took about 90 minutes since this was learn as you go. If I had to do it again, I could do it in an hour. Last edited by knifun; 04-08-2009 at 10:54 AM. 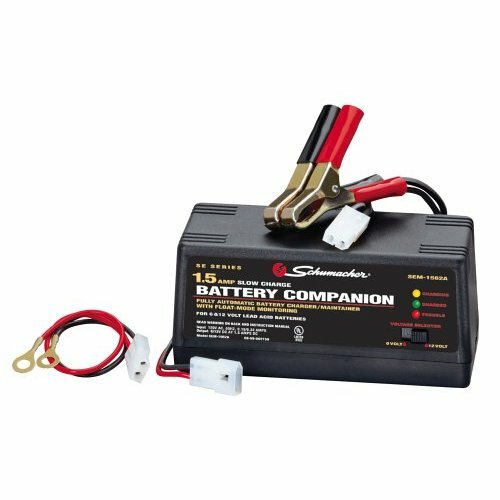 Reason: Added link to amazon showing battery maintainer. Three things I am looking at changing. 1) Paint the screw heads BLACK (on the outside of the wind shield. 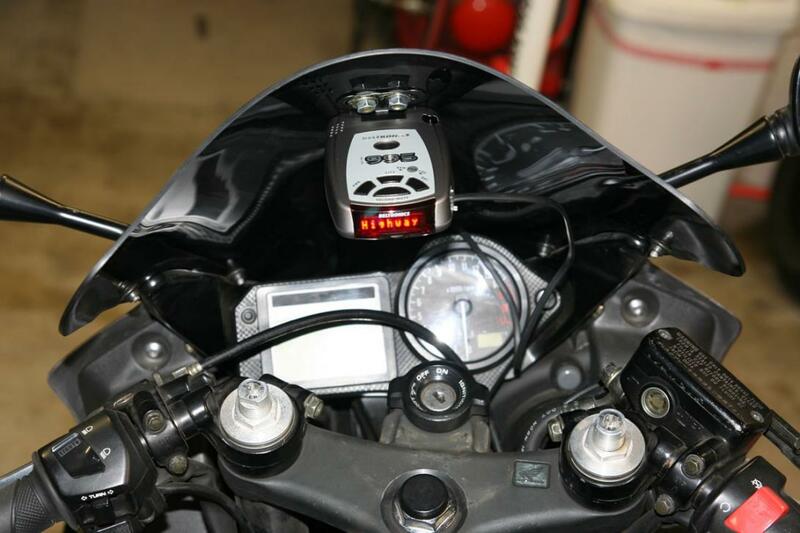 2) Not sure, but I might rewire into the ignition so the detector wires are hot only when the bike is running. Photo 1 - shows Beltronics 995 mount. 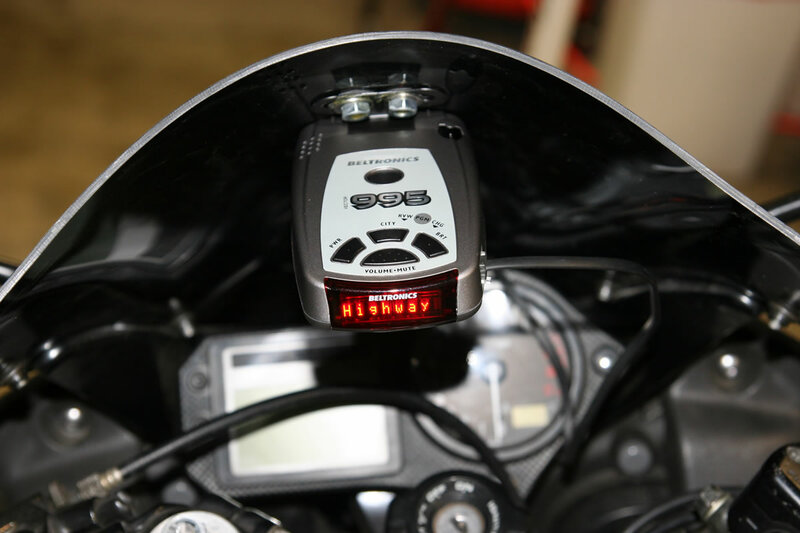 Not only is it a good detector (rated high by all of the detector testing websites), but it has the perfect mount bracket for a bike! 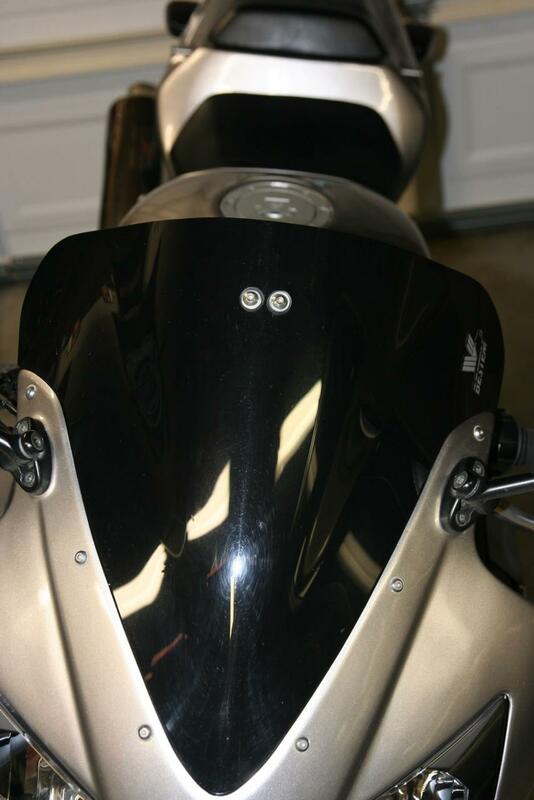 Photo 3 - front of bike, I think I should paint these stainless steel screws black? Photo 6 - Closeup of detector and mount bracket. The yellow you see, I put a little rubber contact cement on the threads so (a) they would hold and not vibrate loose, (b) I can easily remove if I ever want to sell the bike. 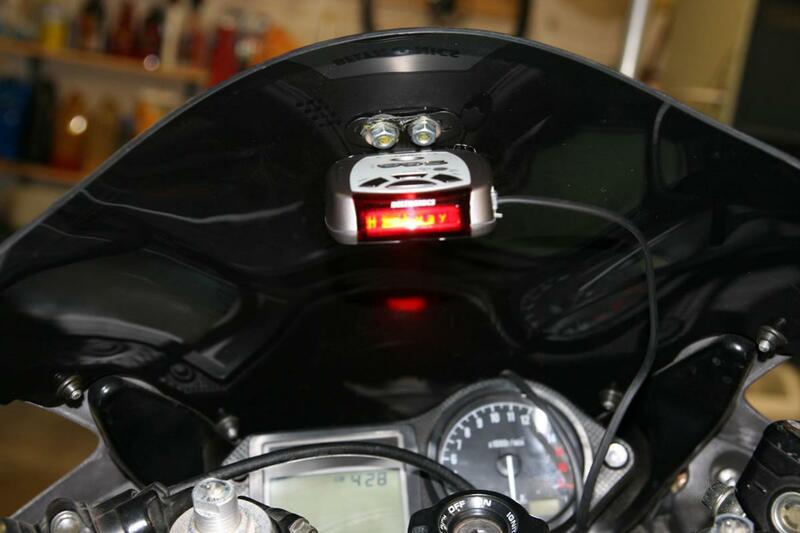 Also, notice the power cord plugged into right side of detector. Photo 7 - Tried to get a straight-on level shot. Why did you decide to hard mount it to your shield instead of using the suction cups on the radar mount? Since I do mainly freeway driving (on the road at 5am, I get to leave work a little early also), I still need to remove the X-Band alerts. No police use X-Band anymore is SoCal, mainly burglar alarms in buildings and red-light cameras. I want to make sure that the alerts are real as I see the policies of the police departments changing now. Many more police and CHP on the road, hiding in every conceivable "nook and cranny" trying to increase the revenue of their departments. I guess that's what we can expect living in a police state. One day into work, I saw 4 CHP hiding on every onramp in a row. I have read that the highest ticketed freeway in California is the I5 going into/out of Sacramento. But, if you take into account Ortega Highway (between I5 and Lake Elsinore) and the stretch of freeway between the El Toro Y (where the I5 and I405 merge) and San Clemente, this is the highest ticketed stretch of freeway in California - hence the radar detector. so what happens if you get pulled over and you have that radar protector sitting right there? Then your really screwed, other than that, I think its awesome, except I would have found a way to mount it to the upper fairing bracket instead of drilling through the windscreen.